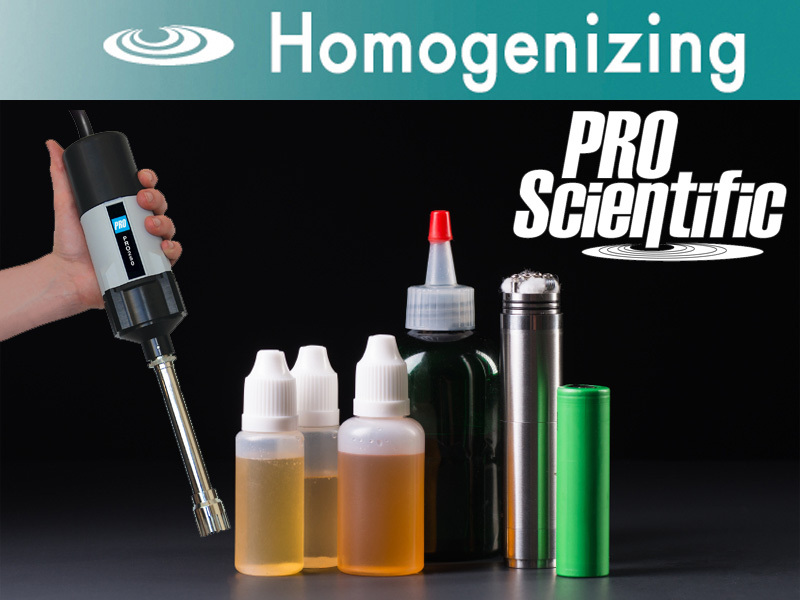 PRO Scientific Homogenizers are ideal for the homogenization of vegetable glycerin for E-liquid, "E-juice"
Homogenization of these samples together allows for a stable emulsion to be created that is shelf stable. A range of setups are available depending upon your budget and processing requirements. Why use a homogenizer to blend VG for e-liquid? Why use a PRO homogenizer to blend VG for e-liquid? Operating a PRO Scientific mechanical homogenizer is easy and simple. No formal training is necessary to operate the equipment. Reviewing the operating manual before initial use provides the end user all the necessary information they need to operate a PRO Homogenizer. PRO Scientific generator probes are easily to disassemble, clean and reassemble, while still providing you a high quality, durable piece of equipment. PRO Scientific generator probes help homogenize your sample without negatively affecting your results. This is ideal when sample integrity is of an utmost priority and you cannot dilute or change the composition of the raw materials. PRO rotor-stator homogenizer generator probes are precision crafted with a very narrow clearance between the inner rotating shaft and outer tube/chamber. This allows for quick, effective and repetitive processing, meaning you will get the results you want each and every time. For samples within the range of 1ml - 100ml, the Bio-Gen PRO200 with a 7mm or 10mm PRO Quick Connect Generator Probe provides ideal results. For samples within the range of 100ml - 1L, the PRO250 or PRO25D Homogenizer along with a 20mm or 30mm PRO Quick Connect Generator Probe provides ideal results. For larger production scale volumes, our D-series or PC-Series Benchtop homogenizers will provide the level of homogenization and precision you require. Will homogenizing affect my steeping time? From some of our customers processing smaller volumes (10-50ml), we have been told that 15 seconds of homogenization is like a week or two of steeping. Our homogenizers are high shear homogenizers which create a uniform particle bandwith of your sample. This is different than a traditional blender. Blending isn't the same as homogenizing and it would definitely take a lot longer. It has been reported that 15-30 seconds of a homogenizer would be equivalent to what might be accomplished by a blender in 20 minutes. The benefit of our equipment is there is minimal to no heat produced during processing.